Some of the common town planning myths are dispelled in the September issue of Northern Insight by Chris Pipe, Director of Planning House. This is a must read for anyone embarking on a development project, especially those who may not have been through the planning process previously. There are some common myths about town planning which you should be aware of before you embark on a project, in this article I want to dispel a few of them. ‘Apply for something bigger than you want to build then you can compromise with the planners to the actual size you want’ What a load of rubbish! Apply for what you want and save time and resources with unnecessary negotiations, if a planner has a scheme they can support they will planners don’t tend to disagree out of obstinance. 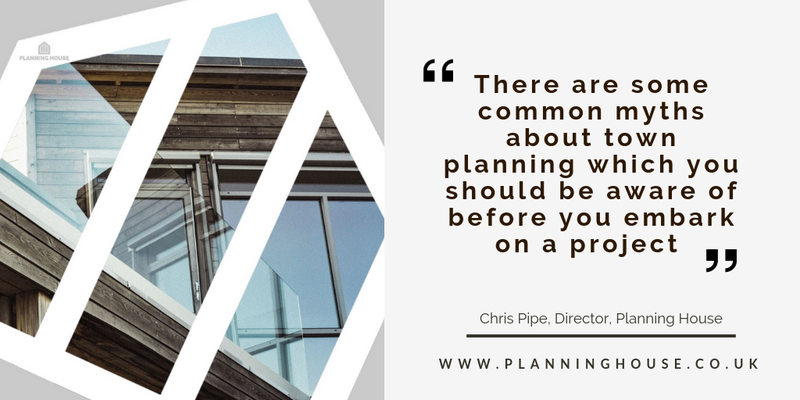 ‘My plans are similar to down the street, so it’s guaranteed to be approved’ Every planning decision is based on specific circumstances. Policies evolve and significantly influence a planning decision. The creation of a conservation area or where a development boundary line is drawn on a local plan can all fundamentally change the way a proposal is viewed. Planning history and constraints of a site also play a huge part in the process. Whilst precedent can be a contributing factor the planning mantra is ‘every application will be determined on its own merits’. ‘Pre-Application advice has been positive so my application will be approved’ Planning decisions are based on adopted policies, however, don’t underestimate local objections and politics. If nearby residents object against your application and contact the parish or local councillors you could also end up with objections from them. Some Councillors sit on the planning committee and can override the planning officer’s recommendations. Speak with neighbours and local representatives in a bid to avoid objections and potential appeal. ‘Planner Officers will guide me to an approval’ A planning officer’s role is to process your application. Some planners are worth their weight in gold and talk to applicants about issues and guide in overcoming them. However, planners have set timeframes to decide an application, they are often under resourced and as a consequence can take the easier route of refusing an application rather than discussing any issues. Contacting your planner to ascertain their view on your application can avoid unnecessary refusal. ‘I’ll get my decision in a couple of months’ Let’s assume your planning application is valid when its submitted, i.e. all relevant information is submitted. Only once its valid does the decision making clock start to tick. Don’t fall into the trap of thinking that if an application is valid no further information could be requested, something could crop up which means you may need to provide further information, potentially meaning further time is needed. Planning applications have timescales for determination and Council’s try to adhere to these, however extensions of time can be requested by the planners you don’t have to agree to them, but unless you appeal against non-determination the Council can take longer to decide your application, especially if the application goes to the Planning Committee for determination. ‘Once I have permission I can start to build’ Sometimes this is the case but generally there are conditions attached to a planning approval which must be discharged, for instance agreeing a brick or tile for your development or providing information relating to boundaries etc. Check your conditions, as discharging conditions can take a number of weeks which you need to plan into your build schedule. Also, don’t forget about Building Regulations Consent which is a completely separate process to planning. ‘I can change my plans as I go’ We’ve all seen TV programmes that encourage alterations however be aware that technically, if a proposal is not built in accordance with the approved plans or conditions it doesn’t have planning permission! Changes can be risky and could have fundamental consequences such as enforcement action, demolition, finances being withdrawn by your mortgage company, or an unsellable asset. Always check that changes don’t invalidate your planning permission.